QMy daughter and I have just rescued four female rats ages 6–8 months old from a bad situation. They have already started to respond positively to our attention and care, and I have a vet friend who has given free care. We have started to try and make some safe and interesting toys for them but my problem is that their living quarters are very inadequate. I cannot afford the $80–$150 price tags that I am seeing for the large, multi-level cages that I think would be good for them and am looking for something used, in good condition, and at a cheap price (or a freebie if someone out there has any). Do you have any links, resources, or web sites for advertising to help me in my search? A Converted Rabbit Cage with the bottom wire removed. Photo by Nichole Royer. QI have several questions. My rats seem to eat things I don’t expect them to. 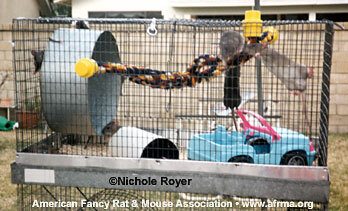 Charlotte, my original rat-mom loved cooked turkey, and all my rats seem to have a sweet tooth. Belly, mom number 2, went nuts the other day when I handled her after making Malted Milk Ball Squares. She BIT MY LIPS to get a taste of them. Any comments on feeding? Next question: The girl rats seem more cautious and less outgoing than the boys until they’re handled extensively—do you ever find this? Also, they seem less adventuresome with food. They don’t like the dried corn as well as the boys and they don’t seem to like to shell the peanuts, whereas the boys love to. And my last question: The two girls who have had litters seem to have a much closer relationship with us than they did before the litters and are closer than the other rats with us. Do you find this to be true? AStay away from sweets all together as far as the rats go. On the other hand, my rats absolute favorite treats are pizza crust, spaghetti with meat sauce, and the #1 favorite is my leftover beef ribs (after I’ve already eaten most of the meat off). Many people forget that rats are actually voracious predators. Meat is a major part of their diet in the wild and they will hunt all sorts of insects as well as smaller mammals like mice and birds. They love meat!!! If you are feeding a balanced diet, they really don’t need any meat added. Give meat as a rare treat and in VERY small quantities; however, it is an absolute favorite. As far as outgoing rats, my girls tend to be more outgoing, but this has a lot to do with the particular line of rats you are dealing with. If your girls are more reserved in general, they probably are more reserved about food as well. And in answer to your question about bonded rats: This tends to happen because of all the attention they get while they have the babies. Before they had their litters they were just one of many, but when their babies were born they were suddenly singled out for lots of one-on-one attention. I have found this to be fairly common.